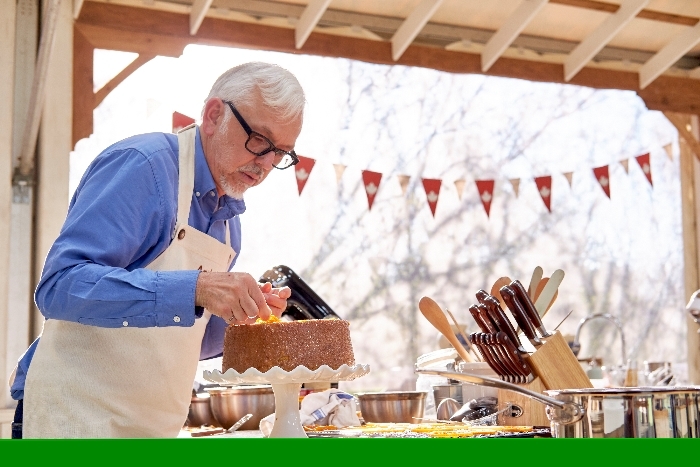 The Great Canadian Baking Show Sends Home First Baker In Season 2 Premiere - Are You Screening? The second season of CBC‘s The Great Canadian Baking Show is underway, and it’s already more Canadian than ever. The series kicked off with Cake Week, and as we got to know the hopeful bakers, it was pretty clear who was going to go home, and how Canada’s version of the series (which now iterations in about two dozen markets) was going to continue to put its “Canadian” mark on the brand… flagrant niceness. As the bakers made their way through an upside-down cake, a chiffon cake technical challenge, and finally a birthday cake showstopper, it was surprisingly difficult to run odds on them. Ultimately, it was Brockville, Ontario’s Tim Chauvin who went home, but judges Bruno Feldeisen and Rochelle Adonis found the positive in everything presented to them. In stark contrast to the British version of the show, the judges give the impression that they’d rather be rid of the technical challenge’s ordering of the contestant’s work. Either Canada has better bakers, the show has lowered the bar on difficulty, or test audiences in Canada really hate Paul Hollywood. Of course, the show also reinforces its Canadian magic with hosts Dan Levy and Julia Chan, but the hosts are supposed to be encouraging. Levy especially, who seems something of a coup for the show off the back of Schitt’s Creek‘s popularity and critical acclaim, is a wellspring of affable charm. With one baker down and Andrei picking up Star Baker, nine remain and the competition is wide open. In the next episode of THE GREAT CANADIAN BAKING SHOW, it’s Biscuits and Bars Week, and the remaining nine bakers have another chance to show off their skills and creativity. The baking continues next Wednesday, September 26 at 8 p.m. (8:30 NT) on CBC, the CBC TV streaming app, and cbc.ca/watch. Fans can enjoy past episodes anytime on the CBC TV streaming app and cbc.ca/watch. Andrei Godoroja, 58, a software engineering consultant from Vancouver, B.C. Wendy McIsaac, 54, a senior policy analyst from Cornwall, P.E.I.